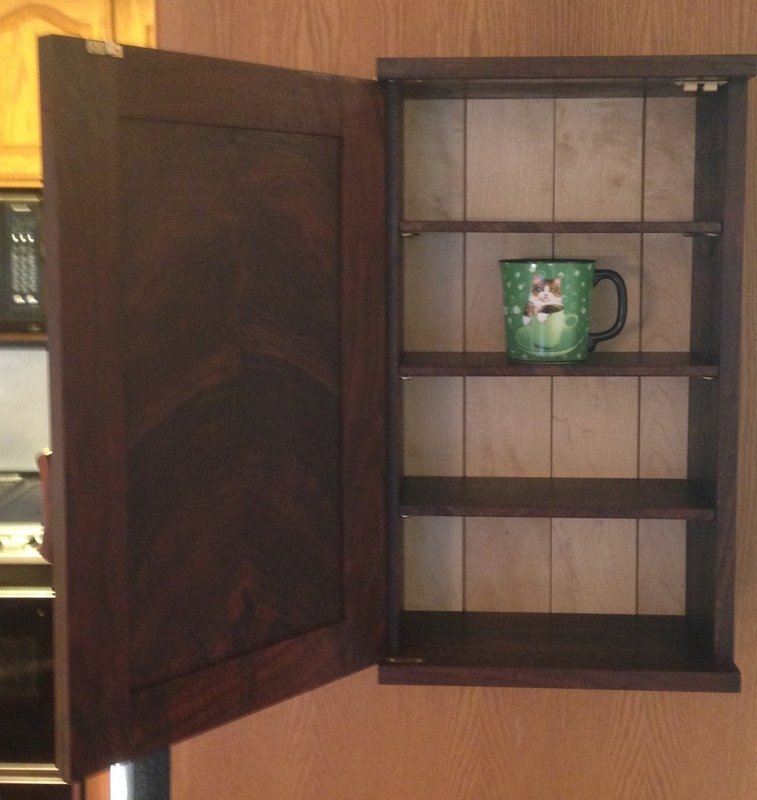 OK, I finally finished this cabinet. Last night I installed the back, the keyhole hangers in the back, a brass catch (I should have used a magnet, it’s a little too hard to close) and slathered on a final coat of Tried & True Oil/Wax mix. It will take a few days for that to dry, and then I’ll was it – maybe by Sunday. These aren’t great pictures, I’m not sure why they are grainy and have lousy depth of field. I took them with my phone, which is all I use. I suspect it’s the lighting in here. 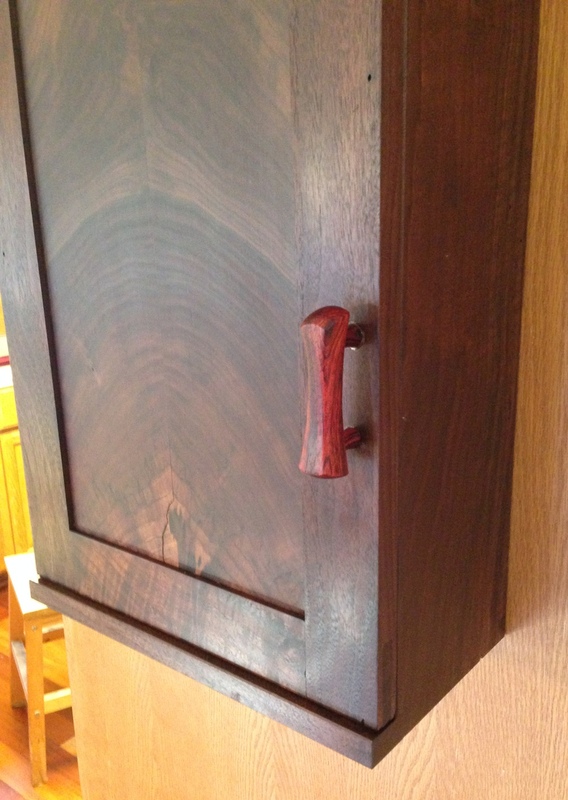 The dark walnut of the cabinet seems to absorb light, so it hard to photograph well. Maybe later this morning the light will be better. That is really beautiful. I really like your design because it serves to present the beauty of the panel to the eye without a lot of distraction. Great job. That turned out really nicely! Does the client approve? Marilyn, Andrew — thanks for the compliments. Overall I’m happy with the result, although it was more of a struggle than it should have been — I think that’s more a reflection on my state of mind lately than the complexity of the project honestly. My wife likes it, although it’s not something she requested. I’m on my way to the lumberyard right now to get some wood for her request. 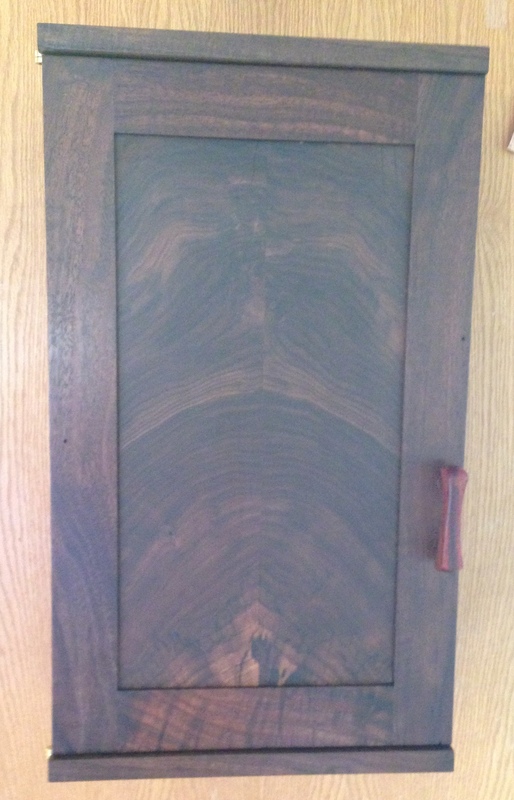 I’m going to make that Byrdcliffe wall cabinet, probably in quarter sawn Sapele. I want it to compliment the dark mission-ish oak furniture in the guest bedroom, but I don’t think I want to make it in white oak. Mostly because I can never get wide enough boards locally – 6″ wide seems to be the max and I need ~8.5″ for this cabinet. We’ll see what they have in stock today. IT’s a great work, you can be proud.